Recently I have looked more at IoT, Raspberry Pi in my spare time. In my blog post I want to share my experience in a series of posts. This post is about measuring temperature, humidity and pressure with Raspberry Pi 2 Model B and Sense Hat and posting this data to Azure Table Storage. I followed this tutorial for connecting to azure with python and these instructions for reading data from Sense Hat. The python script is on github. 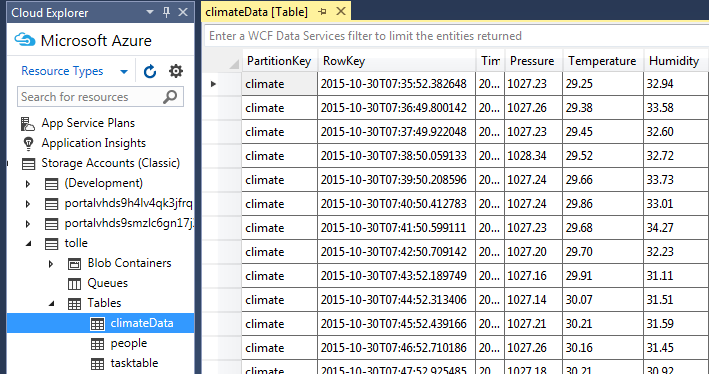 Along the way I learned that only python 2.x can be used with azure and table names cannot contain underscore (I got Bad Request error when I tried to create a table with the name “climate_data”). But overall, the process was straightforward. The temperature is not correct, maybe because the sensor is inbetween Raspberry Pi and Sense Hat where it gets warm. But it is just a Proof-of-Concept. I have used Visual Studio 2015 to see the data in Azure Table Storage. For that I needed to install Azure SDK 2.7. There are many other “explorers” for Azure Storage. I found a formula for calculating more correct temperature on the raspberry pi forum. I also added a notifcation when data is sent by showing an “S” on the Sense Hat. Jimmy Janlén "Den Scrummande Konsulten"
RealActivity is a specialized Microsoft healthcare services and solution advisory firm.